Wacky Weds: Clothes dryer taking forever to dry? You are here: Home / Wordless Wednesday / Wacky Weds: Clothes dryer taking forever to dry? Section M1502 in the IRC governs dryer exhausts – the salient points for new or retrofitting work (2009 IRC) are that it must terminate outside & be at least 3’ from any opening (so far so good.) 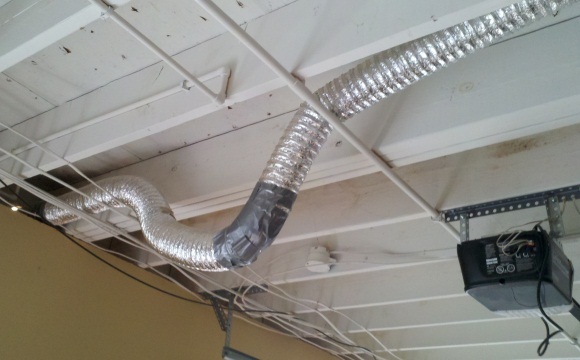 With the exception of the piece connecting the dryer to the main line, it must be smooth metal pipe & supported every 4’ (yeah – big oops). The total length should not exceed 25’ (which includes the flex line from the dryer – which is limited to 8′) to the exterior. Any 90° bends in the line count as 5’ of length.